This page is a collection of the worked example videos for each game. Clicking on any image will jump you to the corresponding video. The Top button will jump you back. 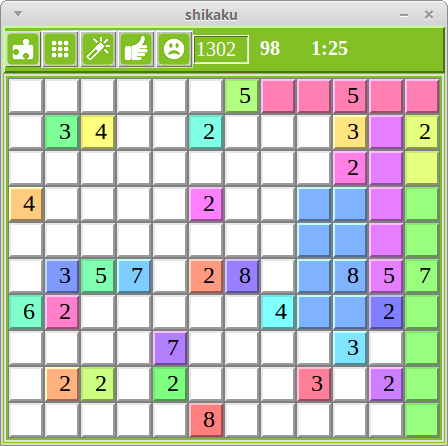 The player uses the green box at the top to enter a new puzzle number and the puzzle is displayed. She marks the diagonals of the cells containing 3s with the "+" symbols (right mouse click) to note they are blocked from being bulbs. Then she adds bulbs (left mouse click) to four cells in succession, their rows and columns lighting up accordingly. She continues to mark cells as blocked or to add bulbs, occasionally clicking on the thumb in the Toolbar to check for mistakes. Eventually this reveals a mistake in top row: the thumb turns down and the incorrect cell is coloured red. She clicks again on the thumb and the program clears the error. She makes more progress and then resorts to using the hint button. This marks a cell which, given the current state of the board, can be solved. However, rather that work out their solution she simply clicks the hint button again and the program fills in the answers for her. Finally she clicks on the sad smiley to reveal the solution. The player starts a game in which the cells are not shaded. She starts entering words using the mouse (left click to select a letter, right click to end a word and middle click to delete a letter). As the words are entered the counter to the right of the sad smiley increases accordingly. After only 5 words she gives up and uses the sad smiley icon to show the solution which shows she got 1.3% of 380 possible words. Next she uses the menu to request that the cells are shaded to show how many words originate from them (their colour will fade to white by the time all the words which start from them are entered). She then clicks the game icon and looks at the generated puzzles, rejecting two of them and then settling on the third. She has a few spelling problems and then gets the solution to end the game. A video from Bridges showing a simple puzzle being solved. The player tries to deduce which bridge can be added as the next logical step. She adds bridges with left mouse clicks. 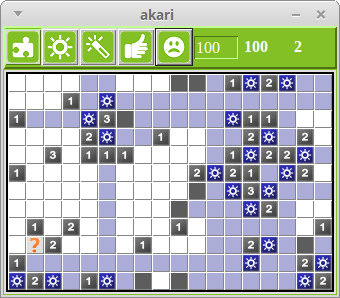 At one stage she is unsure if the last added bridge is correct and so clicks on the hand icon in the toolbar, which turns down and highlights the last bridge as being wrong. A further click removes the incorrect bridge. Later she resorts to using the hint button (the wand icon) to suggest the next move. The player starts a game and moves the cursor around in the number rows causing the corresponding cells in the codeword to light up. Eventually she thinks she spots a pattern which could correspond to the letter "E" and so she clicks on the number row and the letter row to set the number to "E". Next she decides which number corresponds to "I" and guesses that one of the words is "PICTURE". Having set the number for "T" she realises this is probably wrong and undoes it by right-clicking on the "T". Then she thinks she recognises a patter of "A"s and guesses that "PICTURE" is instead "PICKAXE" and proceeds accordingly. Finally she clicks the sad smiley icon to request the solution and so end the game. A video from fillomino. 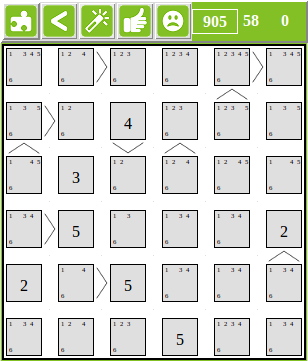 The puzzle is selected by entering its number into the box and typing "Enter". The 6s in the bottom right hand corner are obvious and the player fills in the cells by right clicking on the corresponding candidate values (left click deletes a candidate, middle button restores). Filling in the 7 encloses the 5s, so they become clear. The 7 is easy, but she is lucky with the 2. More 7s and 6s, interrupted by a quick click on the thumb to check for errors, but then under the strain of performing for the camera confidence is lost, errors occur, and she checks for mistakes using the thumb button. It shows an error by the thumb turning down and the incorrect cell is coloured red. Another click on the thumb and the error is corrected. 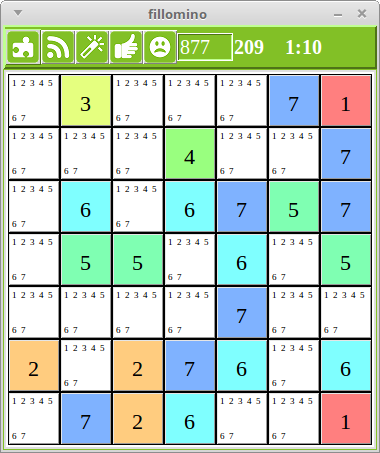 A bit more progress and then a resort to the hint button which clears many candidates using algorithm 0. Another error and finally the clock flashes to signify the games has been finished correctly. The first thing the player does is to right click on the hint button. This labour saving device removes, from rows and columns, all candidates that are already set as solutions. Then she deletes candidates (right click) and sets candidates (left click) by taking into account the < and > symbols between cells. Occasionally she clicks on the thumb icon to check for errors. Then she right clicks on the hint button which when clearing candidates also sets some answers. Next she uses the hint button several times and finally, after a long and apparently fruitless ponder, she uses the sad smiley to show the solution. 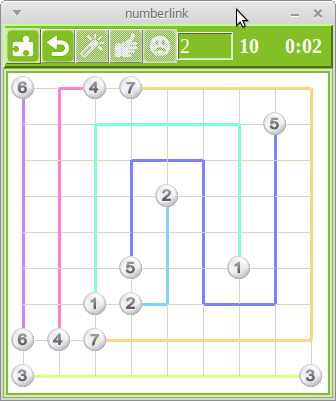 A video from hidato showing an example of the simplest form of puzzle being solved. In these puzzles cells only touch orthogonally: left and right and up and down. In this example all answers are set using the left popup menu in the cells and no use is made of the righthand candidate deletion menu. Apologies that some of the popup menus disappear off the bottom of the video recording. The video starts when the player selects puzzle number 998 and clicks the right mouse button on the wand to reduce the numbers of candidates to manageable size. Note the shading of the cells changing to reflect their numbers of remaining candidates. For demonstration purposes only we use the slider so that the cells containing each candidate are lit up in turn. At first the puzzle looks impossible, but then we see that 1 must connect leftwards to 2, otherwise the corner cell would be isolated. Three follows and then we are stuck until we see that 26 can only be connected on its left side to 32 because the right side is too far away. So we fill in 25, then 24 and 23 follow easily. Then 22 must touch 21 and 23. A quick right click on the wand to reduce the candidates. Now we return to 26 and fill in 27 and 20, followed by 28. 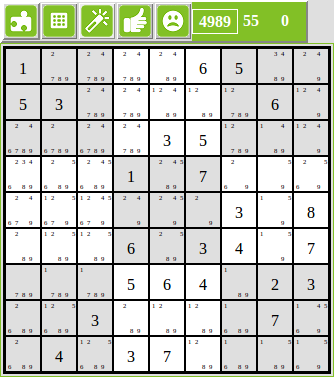 Then 29, 30 and 31 are easy, and so are 4, 5, 6. A quick click on the hand icon to make sure we've made no mistakes. Then we see that 19 is now obvious, then 35, 33, 7, 8, 9. Nervous click on the hand to make sure we are OK so far, and the rest fall into place. As an encore we reload the puzzle by putting the cursor in the Entry box and hitting Enter, then click on the sad smiley to demonstrate how the program shows the solution as a rainbow coloured animation. A video from Hitori showing a puzzle being solved by the worlds most hesitant player. She starts by selecting puzzle 1000. Two places where a cell is sandwiched between identical numbers (algorithm Pairs 0) are quickly spotted and circled. The circled 7 means that another 7 in the same column can be shaded (algorithm Shade Matches) and then surrounded by circled cells (algorithm Encircle Shaded). This leads to another shading. And so she proceeds, occasionally clicking on the thumb to check for mistakes. Later she deliberately tries to make mistakes to demonstrate the error handling, eventually succeeding. Towards the end, to shorten the video, she simply uses the hint button to fill in the cells. 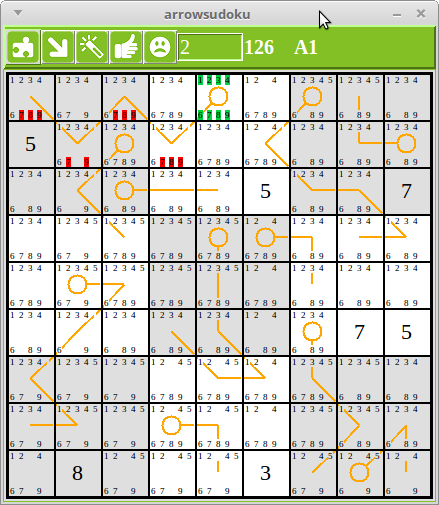 This puzzle requires a very limited set of solving techniques but notice the Linkage 0 and Linkage 1 algorithms which become useful towards the end when the grid has filled out. A video from jigsaw showing two puzzles being completed. The first an image file and the second a built in pattern. 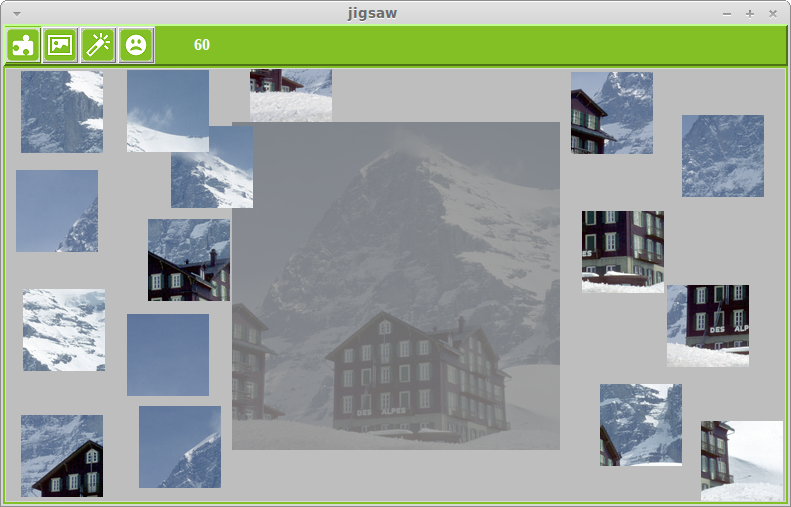 First the board is set to the desired image size, and then the file is read in and automatically scaled to fit the board. Next the board is enlarged to make space for the jigsaw pieces. Then the pieces are created and scattered about the board. Finally the puzzle is solved using the mouse. The same steps are used for the pattern. To save time for the demonstation the puzzles have been broken into the minimum number of pieces. A video from kakuro. To get started the player is looking for rows or columns which have few choices of candidates. Experienced players will know these by heart, but for the beginner each sum has a pop-up showing the possibilities. She finds that the sum 11 only has one combination of digits and so she deletes the others using right clicks. Then she checks for mistakes by clicking on the thumb. Deleting all those candidates is rather tedious so she resorts to using the hint button which will apply the equivalent algorithm first. She gets a bit carried away with using the hint button but eventually starts to think for herself and sets some answers in the bottom left hand corner. Finally she hits the show solution button to finish the game. A video from minesweeper. 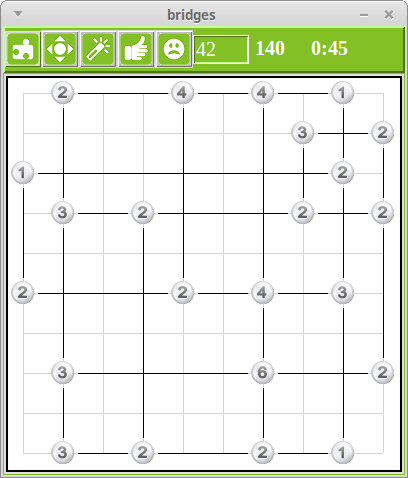 The game is started by clicking anywhere in the grid. 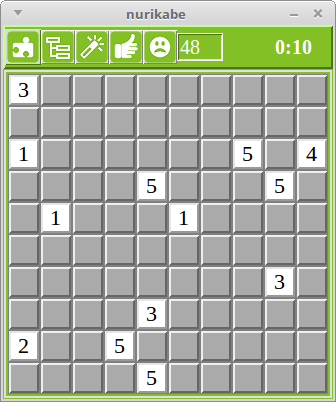 Minesweeper is all about speed. So we got a pensioner to make the demo. Though slow, she does well: right click to place a flag, left click to reveal a cell. Occasionally she clicks the thumb to check that all the flags are correct. After a while she demonstrates the hint button which marks a cell which can be deduced given the current state of the board, but she clicks again so that the program fills in the answer. A bit later she "demonstrates" what happens if you reveal a mine. A video from nurikabe showing a puzzle being solved. Whites from different clues cannot touch which means that completed whites must be surrounded by blacks and that clues touching diagonally must have black cells on the opposing diagonal. The player quickly deals with the initial cases of these two simple consequences: left-click for white, right-click for black. Next, if a white can only extend one way that must be the way, so the 6 in the top left is extended. But then the adjacent black will be isolated if it is not extended too. Then the player sees the potential formation of a block of 4 black cells which can only be prevented by extending the nearby 3. Shortly after the player clicks the thumb to check that she has not made any mistakes. Potentially isolated blacks are extended, then whites. She then pauses and notices two easy blacks that could have been set at the start, and this opens up a new area. Another block of 4 blacks is prevented at the bottom of the grid. The thumb is clicked; the 5 extended. 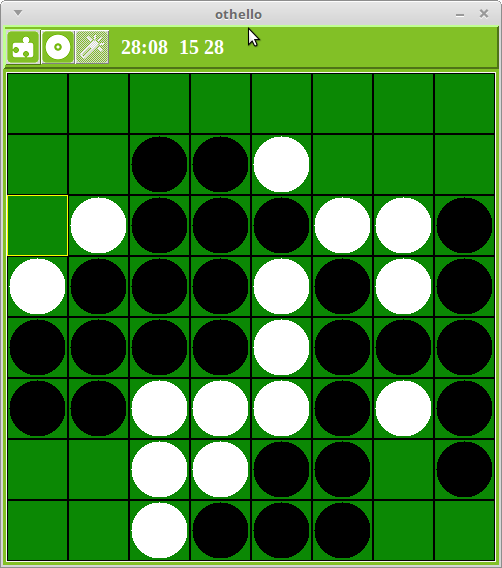 A bit later she cannot see how to proceed and so clicks on the wand which results in a hint 14 being displayed: another potential block of 4 blacks. A further click on the wand and the white cell is added. This has to form part of the white of size 6. Then she notices that however the 5 in the top row is completed it must use the cell in the next row so she sets it white. A few more moves and she is done. A video from othello. The player uses the menu to set the game type to "Human v Machine", chooses to play White and sets the White algorithm to ab-weighted-diff and depth to 5, and then checks that the Machine algorithm is Random. Then she clicks the button to start the game and the clock shows 30.00. The machine is playing Black and so has first turn. Notice that the square the machine has chosen is highlighted briefly (Move Pause seconds) before the move is made and the disks flipped. Then it is the player's turn and the clock starts counting down. 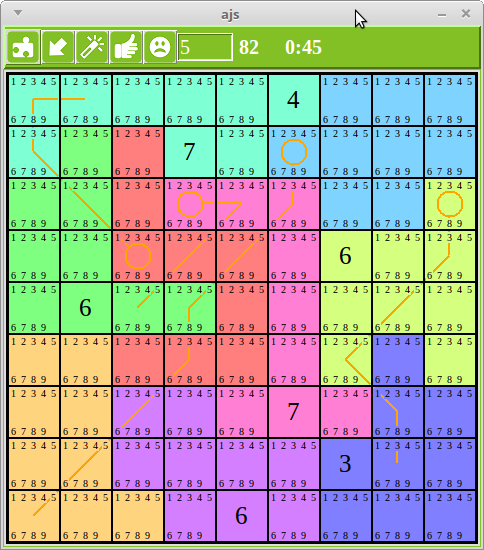 Notice that only the squares with legal moves are highlighted. The player makes her move and the clock pauses. Play continues until she decides to use the hint button. She accepts the hint by clicking again on the hint button. The machine moves and she uses the hint button again, but this time decides to ignore it and make her own choice. Play continues and she sees an opportunity to occupy a corner square (occupying corners and edges is about the extent of her tactical knowledge). Eventually, with a little more help from the hint button (using ab-weighted-diff, with depth 5) she wins 53 - 11. A video from scrabbler. 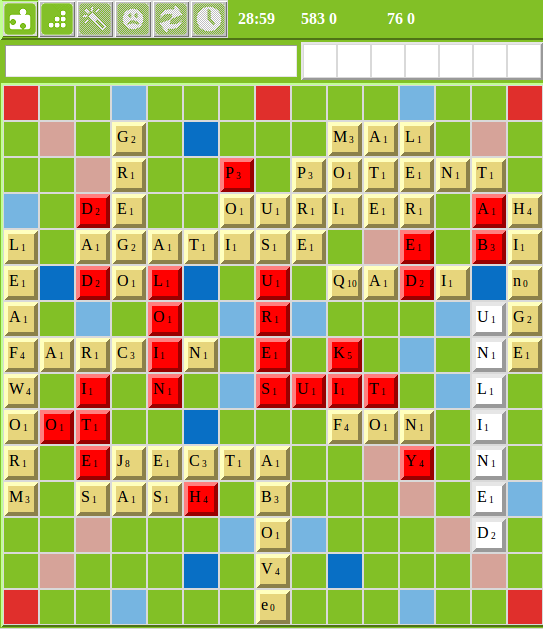 The player starts the game and is allotted her letters. She sees the clock is ticking so it is her turn to go. She enters "PINE" into the white box, types "Enter" and the colour stays white so she knows it is an acceptable word. She positions the cursor above the central square and right clicks. The words is placed and she quickly stops her clock by clicking on the clock icon. 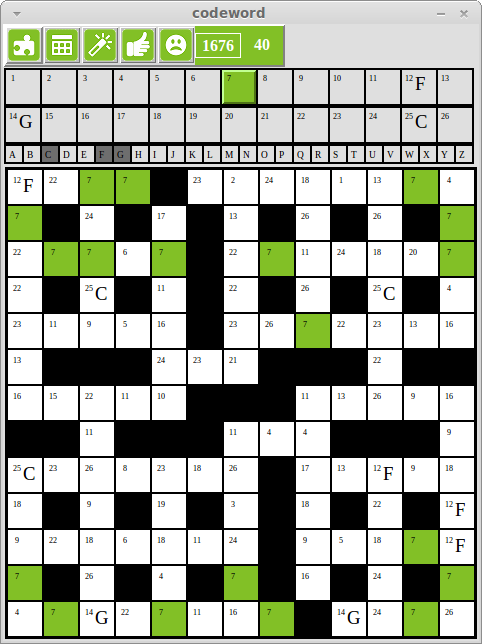 The program instantly places a word from the official scrabble dictionary (which only experts will recognise! ), and it is the players turn again. She enter "LION". A bit later she decides she does not like her current letters and so for her turn clicks on the arrows denoting swap and enter "IIU". The program swaps them and she clicks the clock icon. After a few more turns she clicks on the sad smiley, signalling the program to take over her moves in addition to its own. It instantly finishes the game and displays the finished board. A video from Shikaku showing the easiest 10x10 puzzle being solved with the grey scale shading switched on. 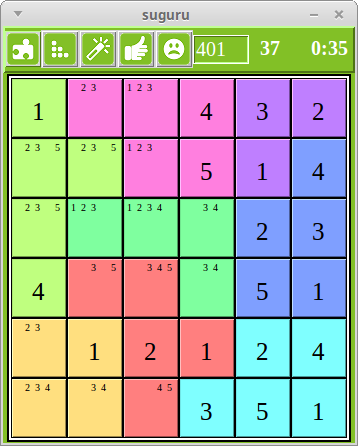 The player selects puzzle number 300 and spots immediately that the 2 clue in the top right is the only one which can reach the corner cell and that a 6 clue can only have a single rectangle. Notice the operations required. 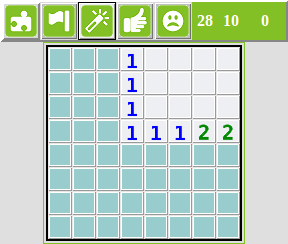 Later the player fills in a complete solution for an 8 clue and then uses the thumb icon to check if it is correct. It isn't, and the program colours two incorrect cells black. A further click on the thumb corrects the errors. Further on the player uses the hint button to request a clue. Note throughout how the shading changes as the number of possible solutions diminishes. 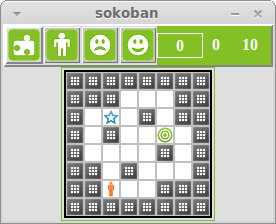 A video from sokoban. The user chooses puzzle 0. She then places the cursor where she wants the man to move to and clicks. The man finds his way there and she clicks the arrow key to move the man and he shoves the case one square. She continues to do this until the case is in the designated position. Next she selects another puzzle and clicks on the lefthand "Show solution". 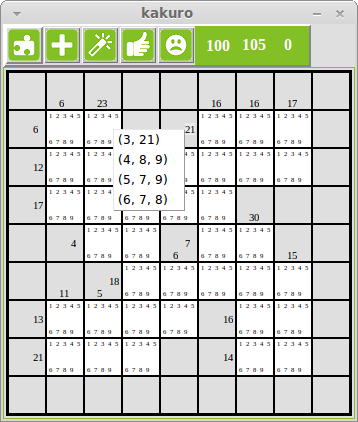 This solution is built into the program for all its 600 standard puzzles. The program shows an animation of the built in solution. 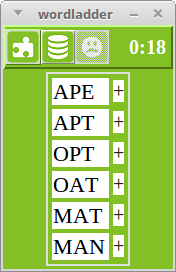 The other "Show solution" button is for the solutions found by the player:once they have solved a puzzle the program remembers their best solution and will replay it when this button is clicked. 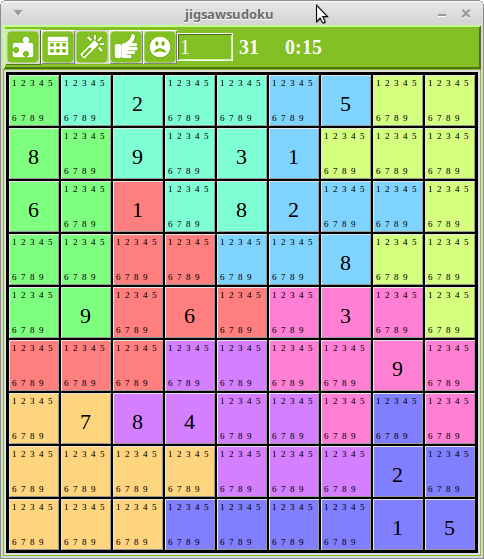 A video from sudoku. 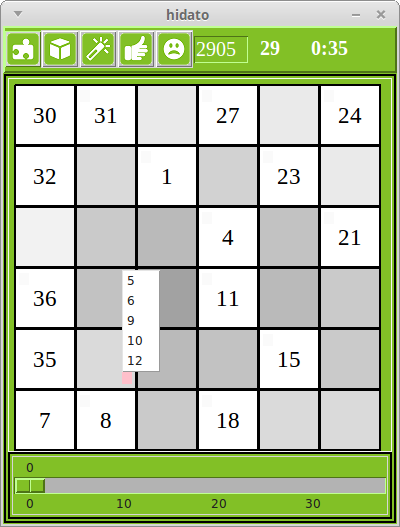 The puzzle is selected by entering its number into the box and typing "Enter". The player then right clicks on the hint button and the program applies the Exclusion Rule exhaustively and so clears many candidates. She then spots a series of Hidden Single cases, each time checking using the thumb and applying the Exclusion Rule exhaustively by right clicking on the hint button. Eventually she demonstrates the use of the hint button a number of times before clicking the sad smiley to show the complete solution. A video from suguru showing a puzzle being solved. 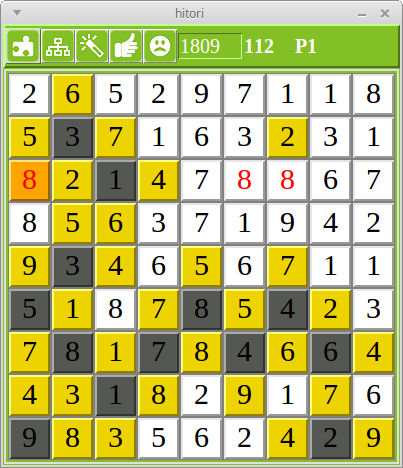 The player selects puzzle number 801 and immediately applies a right-click to the hint button (wand) to remove all the trivial candidates. She makes good progress removing candidates and setting answers, occasionally clicking on the thumb to check that no errors have been made. At one point a hint is requested and prior to a Hidden Single hint being displayed some cells are filled in automatically. A video from sumpuzzle. 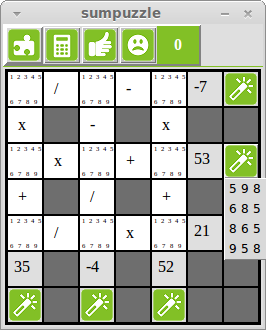 The player clicks the calculator icon to generate a new puzzle. She then left clicks on the wand at the end of the bottom row which causes a popup to display the possible combinations of digits which would satisfy the corresponding sum. For example the left hand digit is one of 2, 4, 5, 6, 8. She then right clicks on the same wand and the program deletes all the impossible candidates for the cells in that row. She repeats this process for all the rows. When she does the same for the columns several answers get filled in because they are the only remaining candidates. Finally she starts to think for herself and completes the puzzle by a series of left and right clicks, occasionally checking for errors by clicking on the thumb icon.